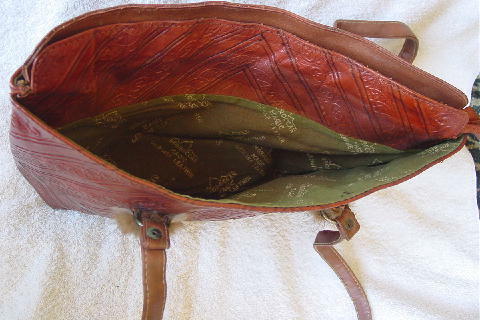 This vintage genuine leather purse was made in India by Moroccan Magic. The olive green fabric lining has some age discoloration which has turned areas into a dark khaki color. It has a center zippered section with an interior zippered pocket and on each side of the center is a large open compartment. 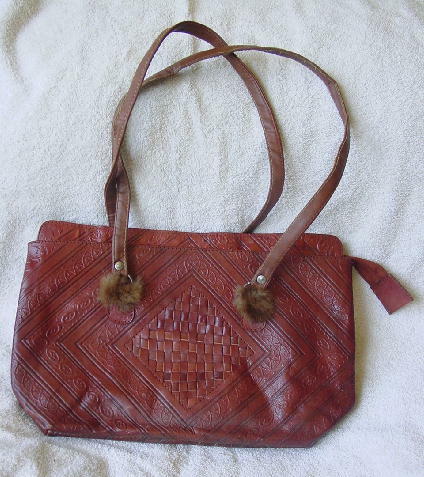 The leather is in a caramel-rust color with elevated designs. Eden attached 4 tufts of brown mink to the base of the strap handles. The back and front handles have the same design pattern.